Sharing a premium drink and dine experience with Terrigal, the new and improved Rhonda’s features a modern take on the woodfired pizza, light and breezy cocktails along with an open roof seating space, perfect to enjoy the coastal sunshine. The team at Rhonda's are dedicated to providing Terrigal with a premium and inclusive dining experience. Every ingredient on the menu has been hand selected to ensure the best quality and flavours are guaranteed and the space has been designed to bring lovers of Italian food together in a fresh and modern seaside destination. Come and enjoy the new dining menu at the downstairs bar and restaurant or experience the new rooftop alfresco space upstairs in the sunshine. The new Rhonda’s welcomes families, friends and beachgoers to enjoy a light lunch, afternoon spritz or delicious dinner perfect for both intimate diners and groups. 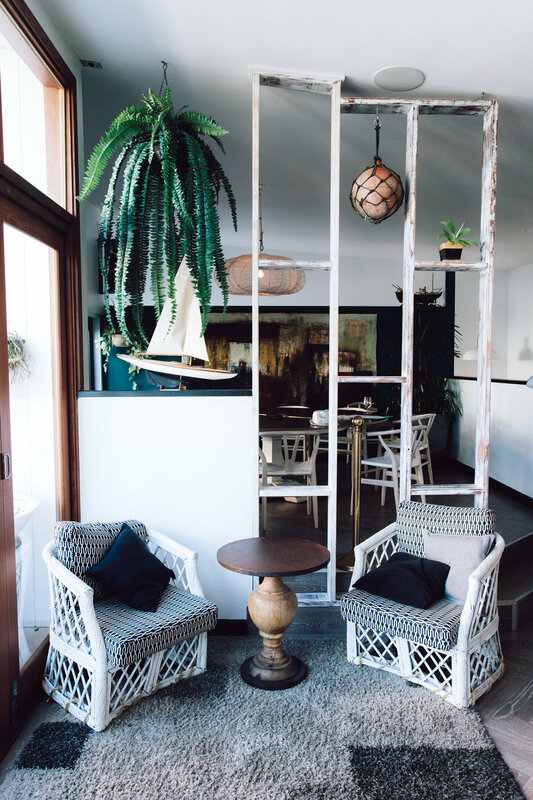 Our beautiful ground floor restaurant offers amazing Italian cuisine, and Terrigal’s only woodfired pizzas in a chic, light, bright and breezy setting. Think Coastal x Italian x Industrial, with a big back bar housing what many consider to be the Coast’s largest selection of spirits. Intimate dining? No problem. Group bookings? Done. Booth, Banquette, Bar and Table seating available. Upstairs offers a casual dining vibe with a nautical twist. Share a pizza or mezze plate amongst friends on the raised bar seating, listen to live DJs and musicians with cocktails in hand being social around the room or sink into one of the comfortable lounge and table settings separated between whitewashed frameworks. Have a larger group? Ask our team about table 100, a round VIP table seating up to 12 people - the most popular seat in the house. Full menu currently available, with new upstairs menu on its way. Only recently created, Rhonda decided to shed a layer and create Terrigal’s ultimate rooftop vantage point along her frontage. Overlooking the Crowne Plaza’s popular beer garden and well, everyone else, the rooftop is best described as light, bright and breezy. It could also be considered the perfect spot to hold a function in! The upstairs bar services the rooftop with food, drinks and cocktails. During the warmer months in peak times expect to see free canapes being served, a mobile juice bar (that you can mix with) and plenty of beautiful people, hair blowing in the wind, cocktails in hand! Various stool seating only. Richard started his career at 5 years old, inside his family’s restaurant in Sao Paulo, Brazil. At 18 years of age he left Brazil, studying and working in the culinary industry throughout Europe before coming to Australia in '98. Upon arriving in Australia, Richard became executive chef for a large group in Sydney city specialising in Italian cuisine before moving to the coast. Rich is one of the most passionate people you’ll ever meet when it comes to food, check out his expertly crafted menu for proof. Its not all just amazing Italian food! Rhonda’s large ground floor bar services the restaurant while also serving up delicious cocktails and catering to unique spirit seekers consistently. A second bar upstairs with a solid selection itself services the round “Table 100” (VIP), casual diners, evening revellers and visitors to the outdoor rooftop. Regarded as one of the best regional bars in Australia our expertly crafted cocktails and spritzer list is a standout. Did we mention we are able to offer over 170 different spirits, amaros and liqueurs? There is something for everybody, and if you cant see it, just ask our staff who are always happy to whip up the classics.